Ubisoft has confirmed via their Facebook Page that Splinter Cell Conviction will support split screen co-op in the game's multiplayer modes including Deniable Ops and the Co-Op campaign. In other Splinter Cell news, Gametrailers is hosting an interview with Patrick Redding of Ubisoft, who chats about all the Conviction's co-op goodness. There's plenty of new footage of co-op too, including some details about the Deniable Ops modes. I gotta say, the mark and execute maneuvers combined with co-op lend some really interesting gameplay options. Player one can simply act as a "lookout" marking bad guys for player two to execute rapidly. 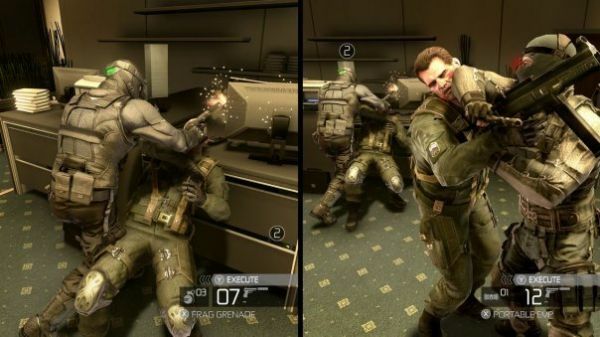 Splinter Cell Conviction hits the PC and Xbox 360 on February 23rd. Page created in 0.3089 seconds.